At Interplastica 2013, the Austrian-German extruder spe-cialist battenfeld-cincinnati will inform about its latest product developments at its stand in Hall Forum, FB48 and Pavilion 8.1/A14 (info corner). The focus will be on twinEX extruders for PVC processing, the helix KryoS pipe head that is part of the innovative greenpipe concept, as well as solu-tions for pelletizing and sheet extrusion. battenfeld-cincinnati has been building extruders for profile extru-sion for more than forty years. The portfolio includes the conical twin screw extruder series conEX with the largest processing win-dow available on the market with throughputs from 10-270 kg/h. For higher throughputs of up to 1,000 kg/h, e.g. 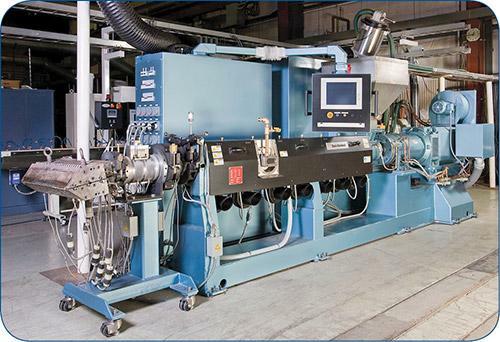 for producing window main profiles in twin-strand extrusion, battenfeld-cincinnati offers the parallel twin screw extruder series twinEX. Recently, Profilink Ltd., the Bulgarian market leader in window profile extrusion, has installed ten new extrusion lines with twinEX and conEX extruders. uniEX multi-purpose single screw extruders for pipe and profile extrusion are available in four different sizes and cover the me-dium output range from 50 to 500 kg/h. uniEX extruders offer consistently high specific throughput at every screw speed and are highly flexible and extremely space-saving. The helix pipe die series was designed for a wide processing win-dow in PO pipe extrusion and is also particularly suited for large diameter pipe applications up to 2,500 mm. The helix KryoS pipe head and the helix VSI-T pipe head with efficient air cooling (EAC) are part of the “greenpipe” concept for energy-efficient pipe extru-sion. The pipe heads make reductions of up to 45% in needed cooling length possible. battenfeld-cincinnati offers a series of single screw extruders with outputs of up to 1,500 kg/h for PP and up to 2,000 kg/h for PS processing with matching downstream components that are par-ticularly suitable for multi-layer sheet production. Among the downstream components, the new, innovative Multi-Touch roll stack stands out. It meets the requirements for perfect transparency and optimal mechanical values as well as low shrink-age. The roll stack concept consists of a two-roll roll stack for pre-liminary calibration and up to seven post-cooling rolls; it can be adapted to higher throughputs by adding more rolls. The battenfeld-cincinnati group with production facilities in Bad Oeynhausen and Kempen (Germany), Vienna (Austria), Shunde (China) and McPherson (USA) ranks among the leading manufac-turers of energy-efficient, high-performance extruders and com-plete extrusion lines according to customers’ specifications. The company is organized in three product-oriented Divisions across all manufacturing sites: Infrastructure (PE pipes), Construction (PVC and WPC profiles, PVC pipes, PVC sheet) and Packaging (non-PVC sheet, granulation, calendering and lamination equipment). bat-tenfeld-cincinnati’s customers benefit from the group’s extensive global sales and service network.